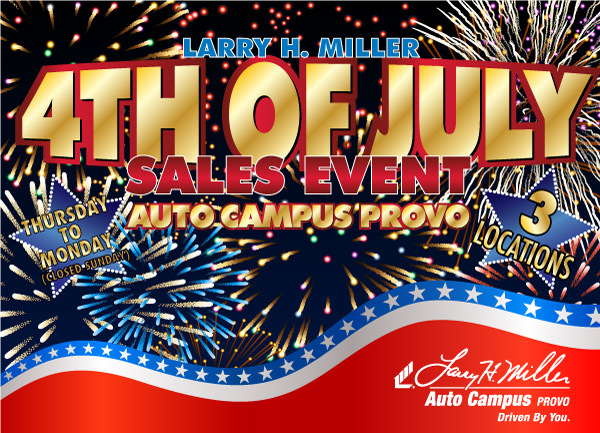 © 2015 Larry H. Miller Auto Campus Provo. All Rights Reserved. 1 2015 Chrysler 200 Limited stock # C1091, MSRP: $25,375, residual at lease end: $13,195. Lease payment plus tax, title, license and dealer documentation fee of $299. $2,950 cash or trade equity down, 36 month, 10,000 miles per year lease, .25 per mile for excess mileage, on approved credit. All rebates and incentives to dealer, consumer must qualify for all rebates and incentives. Offer ends 7/06/15. 2 2015 Ford Fusion SE stock # FC2272. Lease offer: MSRP: $25,950, residual at lease end: $16,349. Lease payment plus tax, title, license, $645 acquisition fee and dealer documentation fee of $299. $2,950 cash or trade equity down, 24 month, 10,500 miles per year lease, .15 per mile for excess mileage, on approved credit. Purchase offer: MSRP: $25,950 less dealer discount: $2,000, manufacturer Customer Cash: $2,000 and Ford Credit financing incentive: $1,000 (must finance with Ford Credit, on approved credit) equals selling price of: $20,950. All rebates and incentives to dealer, consumer must qualify for all rebates and incentives. Offers end 7/06/15. 3 2015 Chevrolet Cruze. STK# 1150100 MSRP: $26,290, residual at lease end $16,300. Lease payment plus tax, title, license, $595 acquisition fee, and $299 dealer doc fee. $2,960 cash down or trade equity down; 39 month lease at 10,000 miles per year, .25 per mile for excess mileage, offer on approved credit. All rebates and incentives to dealer, consumer must qualify for all manufacture rebates and incentives. Offer ends 07/06/15.